FILE - National heroine and Nobel Peace Prize nominee Irena Sendler sits in a chair at her home in central Warsaw, March 14, 2007. An American teacher responsible for bringing to light the story of a Polish woman credited with saving 2,500 Jewish children during World War II has been presented with the award that bears her name. Norman Conrad shepherded three high school students in rural Uniontown, Kansas, as they researched the life of Irena Sendler for a National History Day project. The research evolved into a play, Life in a Jar, in 1999. Poland's Culture Ministry and the San Francisco-based Taube Philanthropies on Monday presented Conrad with the 2018 Irena Sendler Memorial Award in Warsaw's Royal Castle. Poland has designated 2018 the Year of Irena Sendler to mark the 10th anniversary of her death at the age of 98. 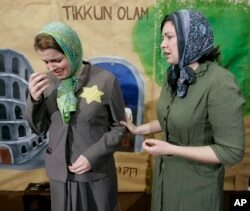 FILE - Megan Stewart-Felt, right, playing the part of Irena Sendler, tries to persuade Jaime Walker, playing a Jewish mother, to give up her children during a rehearsal of "Life in a Jar" in Fort Scott, Kansas, Nov. 30, 2007. A social worker, Sendler and her coworkers established an underground network that smuggled Jewish children out of the Warsaw Ghetto and placed them in the homes of gentile families, convents, orphanages and monasteries. Though most families perished in the Holocaust, Sendler's children were able to learn their true identities because she had painstakingly documented their origins on small strips of paper contained in jars buried under an apple tree. Sendler was largely forgotten until Conrad and his students got involved. Poland's chief rabbi, Michael Schudrich, said Sendler credited Conrad and his students with the recognition she obtained late in life. She often referred to the American students as her children. "She would want all of her network to be recognized. And she also said that the real heroes were the Jewish parents and grandparents who were making decisions that no one should have to make,'' Conard told The Associated Press before the ceremony. "Some of the parents refused to give their children up, and when she went back to talk them again, the children and parents had been taken away on the trains,'' he said. Life in a Jar has been performed hundreds of times across the United States, Canada and Europe. Sendler's story is also available as a book and DVD.